USS John S. McCain after a collision with an oil tanker on August 21, 2017. 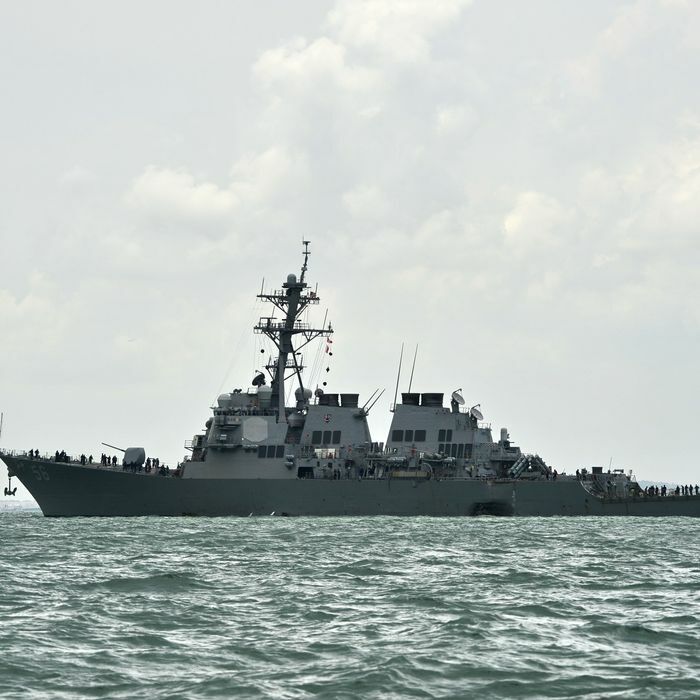 A U.S. Navy destroyer collided with an oil tanker off the coast of Singapore early on Monday, leaving five sailors injured and ten missing. The is the second accident involving a Navy destroyer and a commercial shipping vessel this summer. The USS John S. McCain was east of the Strait of Malacca when it collided with the Liberian-flagged merchant vessel Alnic MC, which is more than three times its size. The accident occurred at 5:24 a.m. local time, when it was still dark outside. The 550-mile-long strait is one of the busiest shipping lanes in the world, making it difficult to navigate. According to a statement from the Navy, “Significant damage to the hull resulted in flooding to nearby compartments, including crew berthing, machinery, and communications rooms. Damage control efforts by the crew halted further flooding.” Four sailors were transported to a hospital in Singapore with non-life-threatening injuries. A fifth injured sailor did not require further medical attention. The Alnic was hit in the front part of its hull, but no crew injuries or oil leaks were reported. Both ships are en route to Singapore for a damage assessment. 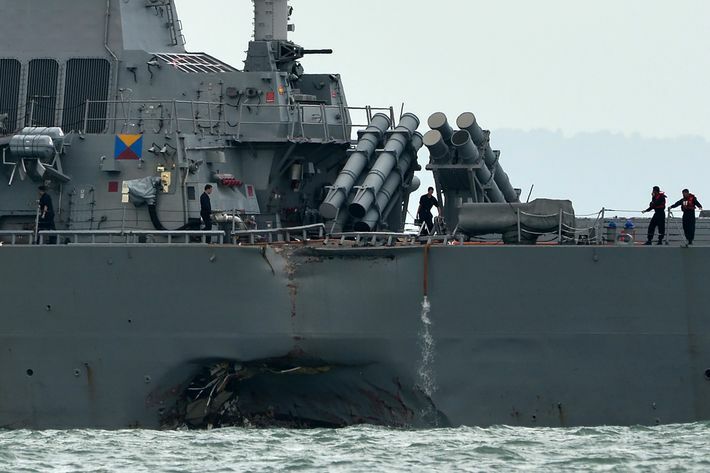 The USS John S. McCain was sailing under its own power, but photos show a hole in the vessel’s side at the water line. American and Singaporean ships and helicopters are coordinating on the search for the missing soldiers. President Trump’s initial response to the accident was “that’s too bad.” He was responding to a question shouted by a pool reporter, and following criticism for the inadequate response, he tweeted that his “thoughts and prayers” are with those searching for the missing sailors. The Navy destroyer is named for Senator John McCain’s father and grandfather, who both served as Navy admirals during World War II. Seven sailors died in June when the USS Fitzgerald collided with a container ship near Japan. Earlier this year, the guided-missile cruiser USS Lake Champlain collided with a South Korean fishing boat near the Korean peninsula, and the guided-missile cruiser USS Antietam ran aground in Tokyo Bay. The incidents are embarrassing for the Navy and could affect readiness, according to Euan Graham, director of the international security program at the Lowy Institute in Sydney. “They were already stretched after the Fitzgerald collision, and now they’ve lost a second frontline destroyer at an acute time in the region, with the tensions around North Korea and in the South China Sea,” Graham told the Washington Post.